Audio Evidence of Ivory-Billed Woodpecker New evidence adds to hopes that the ivory-billed woodpecker, feared extinct, is alive in eastern Arkansas. Researchers have captured bird calls and rapping that reinforces video evidence of a bird in flight. 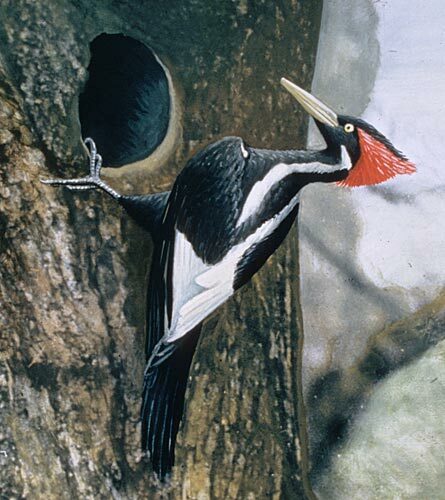 An artist's image of what an ivory-billed woodpecker looks like. So far, naturalists have captured only a fleeting video image of the rare bird in Arkansas. There's new evidence suggesting the majestic ivory-billed woodpecker, once thought to be extinct, is indeed alive in eastern Arkansas. Researchers have captured the sounds of bird calls and woodpecker rapping that reinforces earlier videotaped evidence of the bird in flight. Scientists recently revealed a video sequence shot in 2004 that purported to show an ivory-billed woodpecker taking flight in an Arkansas swamp. However, the video was short and blurry and some experts weren't convinced. 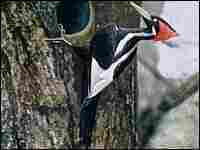 But the new sounds have persuaded at least some skeptics the ivory-billed woodpecker sighting was real. For the latest NPR/National Geographic Radio Expedition report, Christopher Joyce traveled to the Laboratory of Ornithology at Cornell University to listen to the new evidence -- more than 18,000 hours of recordings collected by devices planted on trees in Arkansas wildlife refuges. Hidden in those countless hours of recordings are a handful of gems -- short, faint calls that are characteristic of the species. Researchers used recordings made in 1935 to confirm the authenticity of the new calls. Even with that valuable tool, however, many doubts remained. The team also has another kind of audio evidence from Arkansas: dozens of "double raps." The ivory bill and its woodpecker cousins in Central and South America all make a distinctive double rap or double knock -- what ornithologists dub a "display call." Still, the Cornell team says their evidence is "suggestive," and isn't what they'd like it to be -- the bird or birds are skittish and quiet, the video is short and blurry and the audio recordings are faint. Teams are planning to return to Arkansas this fall.